I’ll keep this short, since merely raising eyebrows about such things has consequences beyond having oneself removed from polite company. As you all no doubt know, universities across the nation are enraptured with “sustainamania” – which is my term for campuses playing “keeping up with the Jones'” when it comes down to efforts to appear to “Go Green.” Now ask most people on campuses what “sustainability” means and you’ll either get the canned answer from the famous Brundtland Report, or a look of consternation that tells you, “isn’t it obvious?” Prod further to ask, “how do you know if any of the things you are doing are in fact sustainable?” and you’ll be removed from their polite company. It might seem reasonable to some people that such questions are not out of bounds, particularly given the hundreds of thousands of dollars colleges dedicate to such efforts and the tens of billions of dollars the government directs into those same efforts (where do you think they might get such ideas?). That said, let me provide for you, sans comments about my raising this question with my employer, one small effort to “Go Green” here in Rochester. 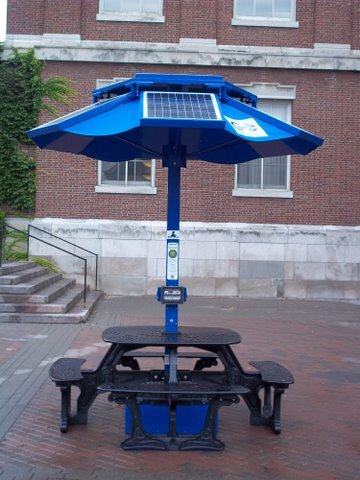 I present to you, in all of its glory, the “Eco-bench,” formally known as the SolarDok, one of several “environmentally friendly” products sold by a company called Enerfusion. I am not even going to try to investigate where that company gets money from, let’s just assume that everything they do is on the up and up. Here is the new Ecobench at my school. Of course, it rarely rains in Rochester and the sun shines all the time, so I just happened to be cherry picking a day to snap these pictures. A full view of the Eco-bench is below. So, this is basically a bench with a table, nominally capable of seating 8 people, but at best capable of seating 4 people, and unless those 4 people are intimate friends, more likely to hold fewer than that. 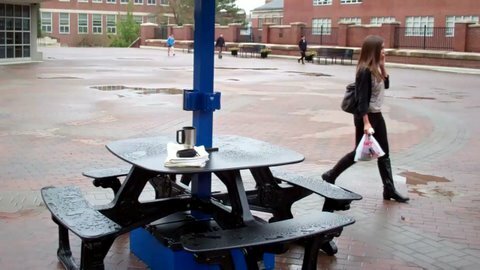 Of course, all campuses need benches and tables, so maybe this was a slightly more awkward version of something they otherwise would have put in. That it is made of recycled materials (which perhaps is green, but that’s not at all clear) and is powder coated instead of painted with traditional paint perhaps makes it a little more expensive than a typical bench. 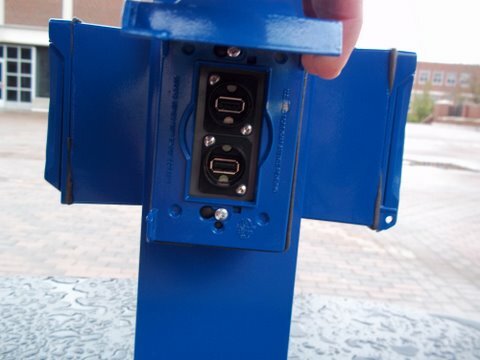 But this bench has one “cool” feature – it is also a charging station. 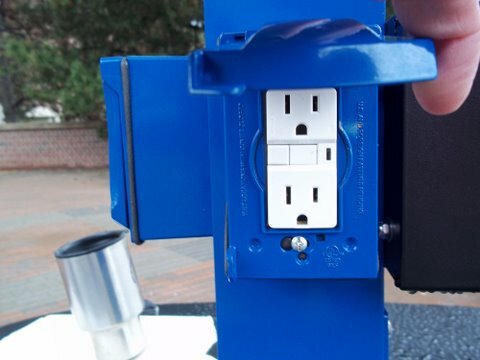 It has about 10 square feet of solar panels attached to its awning, and those panels are connected to a battery (that large box you see below the table) so that people can plug in their laptops into one of the 4 conventional plugs or to plug in their phones, cameras, iPads or other USB devices into the two USB charging ports in the table. Seems cool. As an experiment, to see if it might provide some conveniece for students, you might think it makes some sense to pay a little more for this bench than a typical bench. A typical metallic bench, bolted into the ground, could cost you around $1,000. I am sure University purchases could get a deal at least as good as I can find randomly online. So, when I first noticed this bench, I assumed that perhaps we wasted another $1,000 for the show of it, for a total cost of around $2,000. That’s not ridiculous I suppose, after all, the college spends hundreds of thousands of dollars each year on bagels, cookies, sodas, coffees, etc. 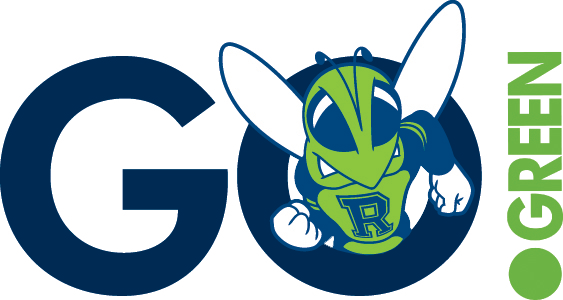 for various events that are held on campus. And if this bench could double as a place to charge up your stuff, maybe it would be a good thing. Now, let’s remember that no student or faculty member I have ever met has ever clamored for an outdoor charging station, nor is there really a need for a table or bench in the location that it happens to be in and also ignore the fact that between September and May, when students are on campus, at best there are three months of nice weather when people might conceivably use the bench. Surveys of students that I have done suggest otherwise, and the university never actually bothered to ask anyone outside of the few “green students” who pushed for its installation if they actually wanted it. That brings up an interesting point – if you asked me if I wanted an Eco-bench for my backyard, I think I would say yes as well, so long as I did not have to pay for it, which of course none of these students does, at least today. Being interested in these sorts of things, I was stupid enough to try to figure out what this “Eco-bench” cost the university, and also decided to figure out what it might do to the environment. So, what DID it cost? Well, a little more than the $2,000 I expected would be the price tag. Answer: $11,500 including installation. Let me repeat that, a plastic bench which charitably seats 4 people, with a table and (perhaps reliable) charger attached to it cost $11,500. Do I need to ask any of my readers under what circumstances you would ever be inclined to make such a purchase. Note that this cost does not include any of the known costs that will inevitably be incurred from maintenance of such an object. After all, the life of those solar panels is not infinite (likely to be in the 25 year range) and the life of the battery is much shorter (and ignore all those nasty chemicals that are housed within that battery), and the various parts of the bench need to be replaced and refurbished just like anything else on campus. Let’s just ignore that and look at exactly what this bench has done. I argue that no bench should cost that much, but perhaps it is a “reasonable” investment for a school to make, perhaps as a way to reduce energy expenditures for the campus, or to have a positive impact on the environment. Indeed, that is the message the bench is trying to portray – this sticker is prominently displayed on it. Making some very generous assumptions about the solar intensity hitting my city and the size of the solar panels on the bench and the efficiency of the solar panels (say, 5 kilowatt-hours per square meter per day of intensity, 15 square feet (or 1.4 square meters) of solar panels and 20% efficiency) the bench could generate about 511 kilowatt-hours of electricity per year (again, these are extremely generous assumptions about power capacity). Let’s make two additional generous assumptions (remember the two we already made: that the device has no maintenance costs, and that it generates a lot more electricity than it reasonably can be expected to produce). First, assume that a student has a device plugged for every single possible hour that the table produces electricity (remember where we live). Second, and perhaps a more tenuous assumption than the first, assume that a student who plugs in a laptop into Eco-bunch is using this electricity as a 100% substitute for electricity that would have been produced on the grid, AND that the power generator in the grid would actually reduce the burning of coal or gas in accordance with how much solar electricity is reducing the need for it (remember that a country like Denmark, a world leader in wind which gets nearly 20% of its electricity from wind, has still not reduced a single coal power plant, indeed it has added some in order to provide the needed backup for the “renewable” energy it produces). How much electricity costs would we be saving under all of these assumptions? Well, including taxes and distribution charges, my average utility bill from Rochester Gas and Electric last year showed me about a 9 cents per kilowatt hour cost for all of my electricity. Let’s assume that on campus the electric costs are twice as high as they are for my house. So, each kilowatt-hour of electricity produced by the bench will “save” my campus 18 cents of electricity costs. 18 cents per kilowatt-hour times the 511 kilowatt hours yields an annual electricity savings of … $91.98. You might want to scratch out on an envelope what a more realistic estimate of the costs savings would be (I’d bet they are closer to $15). OK, so here’s a simple cost-benefit calculation. Would you spend $11,500 on an asset which generates income of $91.98 per year? That’s a return of 0.8% per year at best. Or to put it another way, suppose the bench was infinitely lived, how many years would it take to recoup that investment if we ignore discounting? Only 125 years. Not bad! Well, my good environmental economists might be thinking, “yes, it’s costly, but it might still make sense! After all, it is costly to burn coal to make electricity, it will contribute to a warming planet, so maybe this bench reduces enough CO2 to make it worthwhile.” Sure, I like that question, it is a good one to ask. The Carbon Fund tells us that each kilowatt hour of electricity produced by a coal fired powerplant (oops, there’s another assumption – after all, there is a large nuclear plant near here, as well as the possibility of getting energy from hydro, so let’s ignore that too and assume that all electricity being replaced comes from coal; UPDATE in October 2012, coal makes up LESS THAN 4% of New York’s electricity generation)) generates 1.31 pounds of carbon dioxide. Therefore, assuming 100% of the electricity from the bench replaces coal production entirely, then the eco-bench will save about 722 pounds of CO2 from being emitted each year. This is roughly .36 tons. What is the economic/climate damage from each ton of CO2 emitted each year? The midrange estimate from the Intergovernmental Panel on Climate Change is about $25 per ton of CO2. This is the value/cost of rising sea levels, expanded malaria ranges, changes in crop growth, etc. that we are told will happen when the climate warms further. So, for a situation to make environmental economic sense, we should be willing to pay up to $25 to prevent $25 of damage from happening. If we pay $30 to stop $25 of damages, we are actually inflicting more damage than by doing nothing. Note that neither outcome may be desirable — but if we cannot use this metric, then what CAN you use to guide policy (btw I have entertained dozens of different responses to that question). You might reasonably cite distributional concerns, but those are not to be confused with the waste of resources if we spend $30 to stop $25 from damages. The per pound cost of CO2 emissions is therefore 1.25 cents. Therefore, the 722 pounds of CO2 that would have been emitted were it not for “eco-bench” would be expected to cause about $9.03 of damages to the globe. So, we’d be making a good environmental decision if we spent $9.02 per year or less to prevent the damages and a poor one if we spent more. Therefore, ignoring the dollar savings from electricity, we have managed to spend $11,500 on an asset which generates an annual environmental savings equivalent to about $9.02 per year. What is the “return” on an asset like this? It is 0.078% per year. Or to put it another way, this is the equivalent of spending $32,050 for an asset which reduces one ton of carbon dioxide every year. Suppose a reasonable long term return on safe assets (i.e. the returns are assured, which again is not true for Eco-Bench) is 5%. An asset worth $11,500 would yield a stream of certain benefits of $575 each and every year, forever. Therefore, the “Eco-bench” is equivalent to spending about $575 every year to prevent a cost of $9.03. This is worth repeating. As an environmental “investment” this Eco-bench spends roughly $575 every year to prevent $9 of damages. My estimates are already incredibly conservative. But suppose I am off by a factor of twenty beyond my already conservative estimates – the thing is still an awful idea. In that case, we’d be spending over triple the amount we would ever want to spend to prevent the damages from the emissions. As it stands, we are spending more by a factor of sixty-four. That’s not 64% more. That’s not 640% more. That’s more like 6,400% more than we ought to be spending. Eco-bench ought to be renamed “eco-stench” because that’s how good an economic investment it is and its really how good an environmental investment it is. Might I remind my readers that our fully loaded tuition and fees exceeds $56,000 per year. Even if every student gets a 50% discount on this price, we’re talking near $30,000 per year. Remember that some of my students pay their own way for college – some famously working full-time jobs or two part-time jobs just so they do not have to rely on their parents and/or government. Or remember one of the biggest concerns of the OWS crowd: massive college loan debt with no job prospects to show for it. Oh, and did I forget to make clear one additional assumption we are making above? That the bench itself was costless to produce, or at least imposed no more environmental impact in its production than whatever bench would have replaced it (of course, this ALSO assumes that we need the bench, that there is no alternative better use of resources than putting in a bench). We wouldn’t expect folks to recognize this would we? After all, I’ve seen people complain that fracking for natural gas is bad because it takes concrete to build the well-pad and it requires cars and trucks to service the well-pad — as if no resources are required to produce and deliver energy from windmills or solar panels or biofuels. Sure. This is where I’ll have to stop, not because the story gets less interesting from here, but rather because it gets more interesting from here. But divulging anymore would probably do more than have me removed from only polite company. And as I am not a bachelor with few responsibilities, that’ll have to be the end of the story for now. UPDATE! : Hey, look, we even just won an award for our efforts. No mention of course about whether any of those efforts accomplish their goals or are cost effective. Who thinks the recycling program is cost-effective? What about building to LEED standards? OK, so ignore costs – who is confident that we’ve done serious calculations to ask whether these sorts of things actually improve the environment? After all, the entire city of Rochester has never bothered to do a cost-benefit assessment EITHER of the economic costs and benefits OR the environmental costs and benefits. It’s not very collegial to be asking such questions. Nope. Sustainability is like pee-wee soccer – everyone wins just by showing up. The 9th place team gets the same trophies as the first place team. UPDATE #2: We just won another award! This time from the EPA. Not the same award I gave out last year of course. I was wondering about that table myself, I think my day is now made. I’ve yet to see someone actually use it. I’m wondering how well the solar panels will weather the winter, too. Still waiting to see someone use it despite passing by thirty times a week. Hey, man. It’s about people and sustainability, not just dollars! I never ceased to be amazed by your productivity Wintercow, I don’t know where you get the energy or time to generate these analyses on a near-daily basis. Clearly you are not solar-powered. Hmm…now why didn’t they just put a small windmill on top of that, instead of a solar panel? They should have gone over to RIT to ask us how to do it properly :p Would have made some kid’s senior project…and would have been free for U of R.
jb, he has a calculator, not a slide rule, but I too am amazed often by his originality. During WC’s “brief” piece I lost interest in that contraption when, after a few shaky assumptions and not accounting for depreciation, the U of R’s project yields a return of 0.8%. this is supposed to be a demonstration project? The green version of keeping up with the Joneses? Or keeping up with the Joads? Speedmaster makes an astute observation about lake-effect weather. I have not spent much time up there, but have spent three or four months in Erie and Cleveland. One wonders about the U of R maintenance department, who probably have a busy winter during snowstorms, but probably have a good shop to build a nice picnic table with a hole in the middle, all the edges routed out smoothly. Then you stick in an umbrella, put in a super-efficient set of solar panels made by your own engineering department by hand, or by the guys over at RIT, wire it up, and how does it cost $11,000? Does the university use the same math to calculate tuition, and I am not implying WC should get a cut in pay? And yes, even if it cost $10 and kept the batteries charged until 2090, it is a monument to foolishness. I wonder if it would be more sustainable to have students huff buckets of water up a hill to power a waterwheel. At least it would give the students a lesson in wealth destruction and futility. They should have limited themselves to only local vendors. @ Michael Yea and it may even have some savings on the healthcare side… Ever Better! i could have made it in my shop at home for about $500, i would go into making these but doubt that there is much of a market for these as even the “greenies” at your school only bought one. You also forgot about the costs of getting it “certified” as being green. I have noticied that green products such as these are often priced at a crazy price because crazies buy them, they don’t seem to priced where the supply and demand curve meet, there is some sort of market segmentation going on that separates the crazies from their (or rather our) money. The will not see a dime of my money. Ever. That's Just a Silly Model, What About the REAL World? Do You Hope that "Your Guy" Wins? But What About the Poor? What Does Your Bumper Sticker Say? Would You, For $3 Trillion? The Unbroken Window © 2019 All Rights Reserved.